We are now officially into summer. The weather is sunny, hot and beautiful; and I’m cooking up something special for our breakfast. Something with a tropical vibe to it. The French Toast and fruit mixture complemented each other nicely and provided a “summery” feeling to a breakfast that we enjoyed eating out on the deck. 1. Spray a 13 x 9 inch baking pan with cooking spray. Arrange the bread slices snugly in the dish. 2. Combine the milk, eggs or egg substitute, sugar and vanilla, stirring with a whisk. Pour evenly over the bread. Turn the bread slices over to coat evenly. Cover with plastic wrap and refrigerate for 8 hours or overnight. 3. Preheat oven to 375*F. Remove bread mixture from refrigerator, uncover, and turn bread slices over. Sprinkle evenly with coconut. Let stand at room temperature for 15 minutes. Sprinkle on coconut before baking. 4. Bake, uncovered, at 375*F for 30 minutes or until coconut is golden. Serve warm with fruit compote. Just out of the oven–smells wonderful! Colorful fruits go into the compote. Combine all ingredients. Cover and chill over night, or prepare while toast is baking. Serve alongside the French Toast. Ooooooh,Baby, oh,baby! 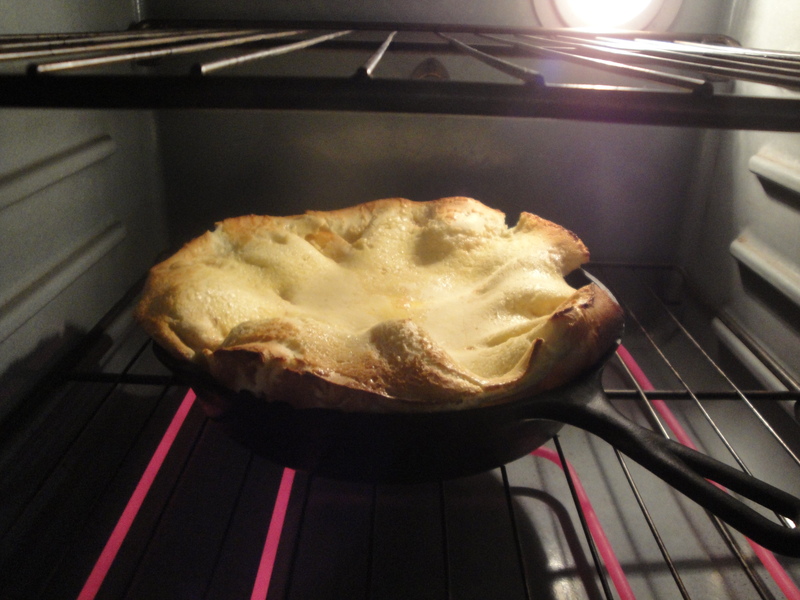 Dutch Baby, that is. A puffy, soufflé -like pancake for breakfast, brunch, or anytime at all. The one I made for a treat recently had my fave fruit in the batter, (peaches) and a stone fruit (plums) compote to spoon on top when served. This is so fun to make. I love the way it puffs up in the oven, and then immediately starts to deflate when you take it out. That’s what its supposed to do–forming a depression in the center that you can fill with all kinds of good things. Like fruits, jam, syrup, or even sautéed vegetables if serving it as a lunch or dinner entree. 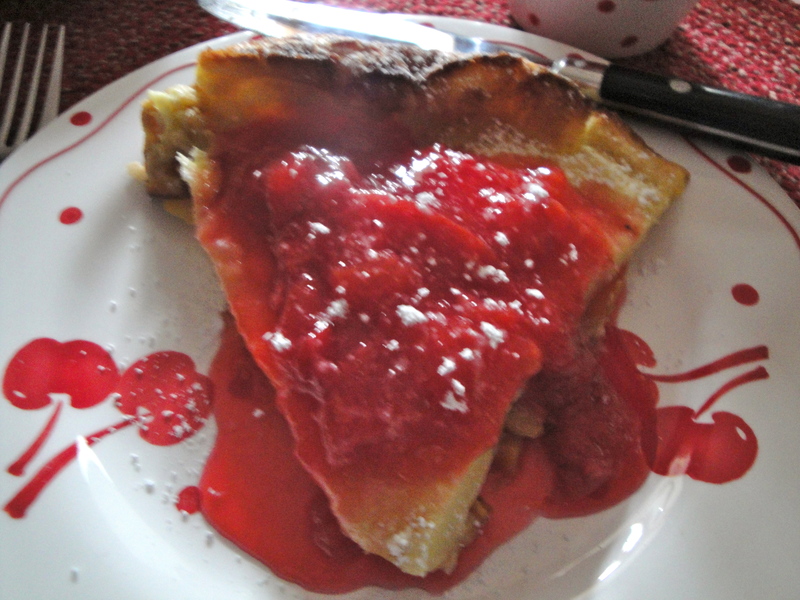 The title given to the recipe I used is Peach Dutch Baby Pancake with Cherry Compote. I didn’t have, nor could I find, any cherries, so I substituted plums. A little tart and a little sweet, beautiful pink color, they worked for me and tasted wonderful. It occurred to me after tasting it that this compote would make a good topping for ice-cream also. 1. 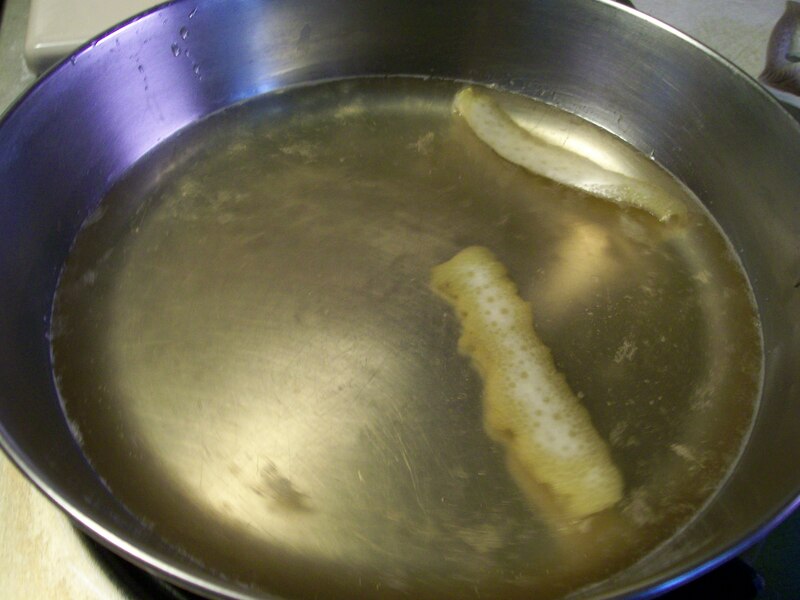 Bring honey, lemon peel and lemon juice plus 1/2 cup water to a boil in a small heavy saucepan. 2. 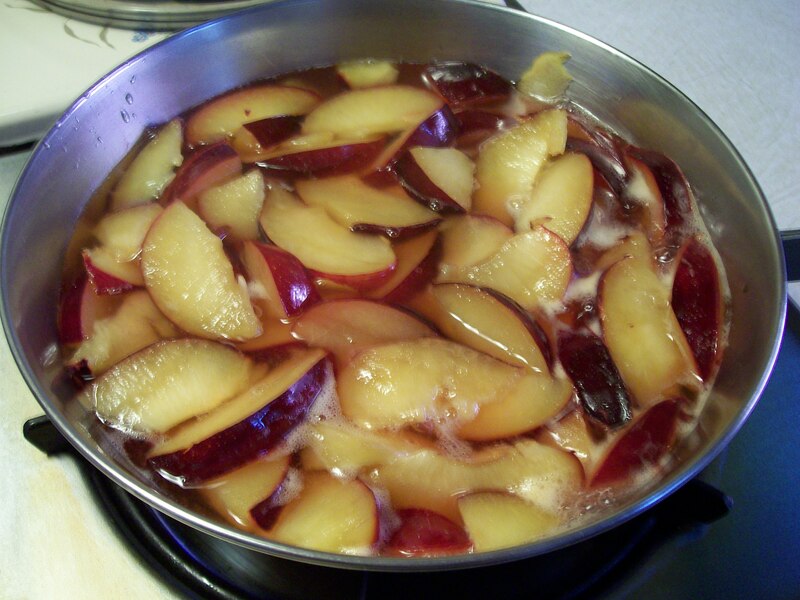 Add fruit and simmer briskly, stirring occasionally, until sauce is syrupy, about 15 minutes. 3. Transfer compote to a medium bowl and chill. 4. 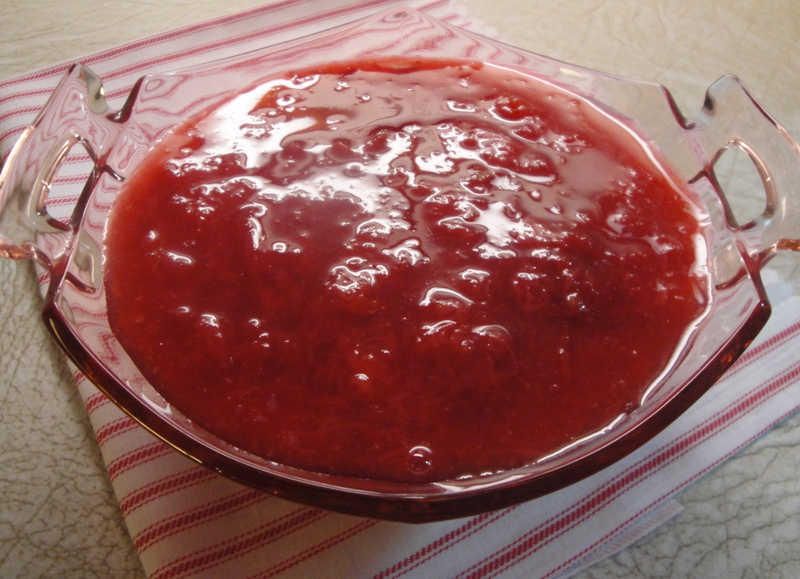 To make ahead: Compote can be made 1 day ahead. Cover and chill, Remove lemon peel just before serving. 1. Preheat oven to 425 degrees. Melt 2 Tablespoons butter in a small saucepan or in the microwave; pour into a blender container. 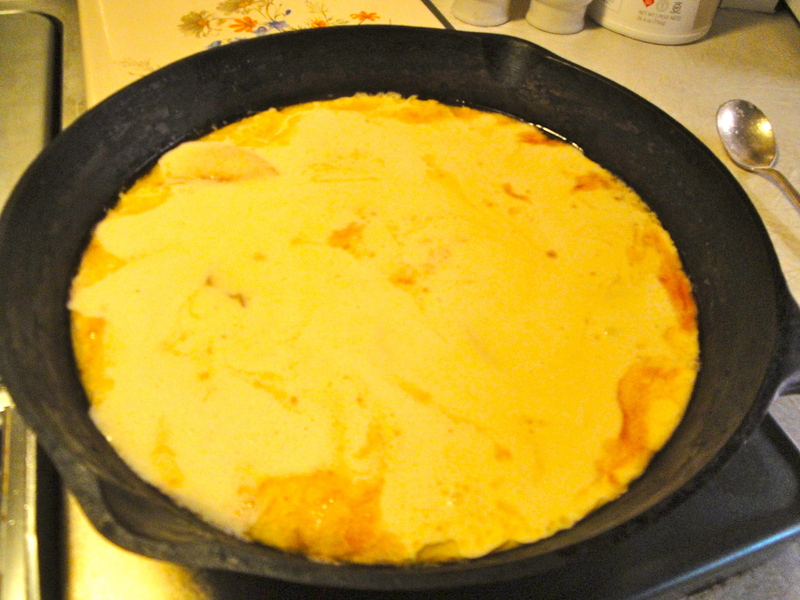 Add eggs, flour, milk, 1 Tablespoon sugar, vanilla, and salt. Blend batter till smooth; leave in the blender and set aside. 2. Heat a 12-inch cast-iron ( or other oven-proof) skillet over medium heat. Add remaining 2 Tablespoons butter and remaining 2 Tablespoons sugar and cook, stirring constantly, until sugar starts to caramelize, about 2 minutes. 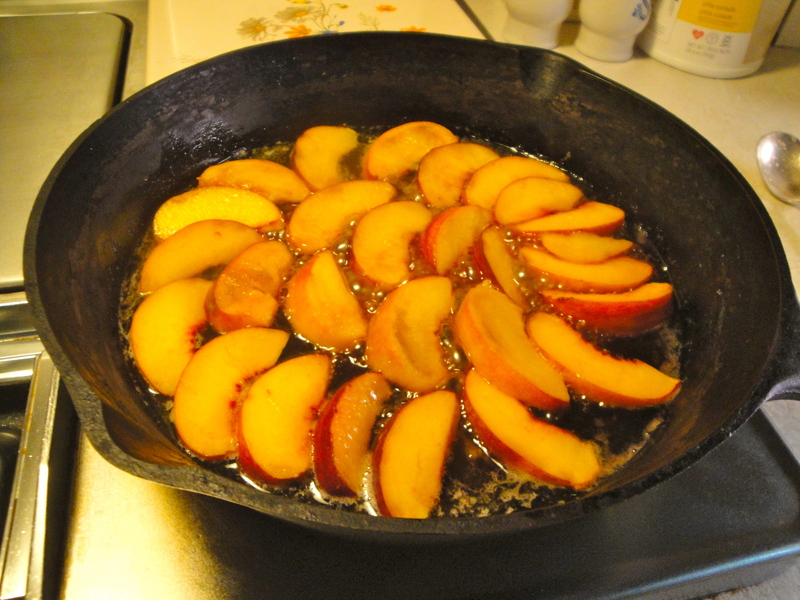 Add peaches to skillet; increase heat to medium-high and cook until softened, about 2 minutes. 3. Briefly reblend pancake batter. 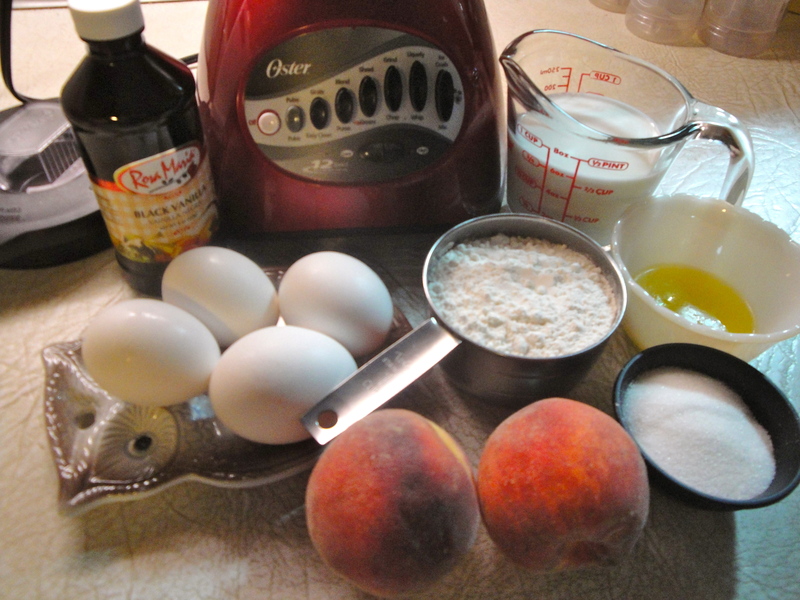 Pour evenly over peaches and transfer to oven. 4. Bake pancake until puffed and golden brown all over, 17-20 minutes. It will deflate as soon as it’s removed from the oven. Dust pancake with powdered sugar and serve immediately. Serve with compote alongside.